A couple of weeks ago we went on a wonderful mini-break staying in London. I had always wanted to go to the Chelsea Flower Show as I have loved plants and gardens all my life, but it seemed there was always a reason that I couldn’t get there. This year it was actually Simon who suggested we went as he thought it might be a good place to use his wonderful new camera. Don’t get me wrong, he does like flowers and trees, and he is interested in the designs of gardens, but he doesn’t have the passion for gardening that I have. I was so excited when we booked the tickets a few months ago. 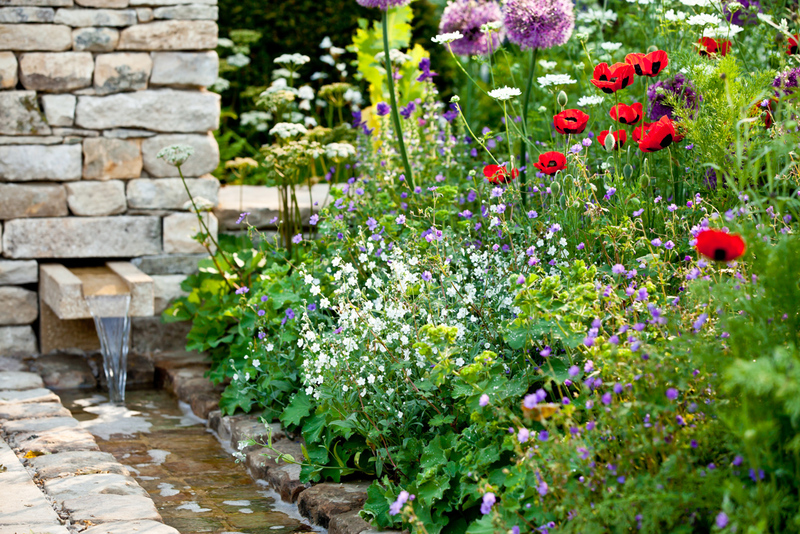 At the time I was going through a fairly good phase healthwise and really thought that with a few planned breaks, I’d be up to mulling around the show gardens and the wonderful exhibits and show stands that makes Chelsea the world-renowned show it has become. I spent hours on the internet researching places to stay and found The Presidential Apartments in Earls Court. I always feel slightly claustrophobic in a hotel room, hating the feeling of being boxed in and normally having nowhere else to sit but on the bed, and these apartments appeared to give you more space with a separate sitting area and even a kitchenette to prepare your own breakfast etc. I booked through a booking site and managed to secure a fantastic deal so I was a very happy bunny! As the time became closer I was becoming quite despondent. My feet, legs and hips had decided they really did not want to work. I can only explain it as if when you wake up, instead of feeling refreshed and awake, you feel as if you have been mountain climbing all night and you have virtually no energy and considerable pain. I knew that my legs could only hold me up for a few minutes at a time, with very long rests in between, and was beginning to think that maybe we should just cancel and accept that this year was not going to be the year I’d eventually get there. Simon though had a totally different plan in his mind. He was determined that we would go and still have a wonderful time, we’d just take my wheelchair along too. I have a wheelchair and an electric scooter, and whilst I am quite happy to use the scooter if we go for a ‘walk’ in the forest, or along by the coast, I have avoided using the wheelchair for a few years now. I would normally rather stay indoors and read or listen to music than brave the outside world in my wheelchair. I know it’s sometimes stupid, but I absolutely hate being in it. I was in a wheelchair quite a lot as a young child (another story!) and I think because of that I almost have a phobia about using one. I feel like I’ve given up. I also know it’s daft, but in my head I feel capable of everything, and so in my heart I feel a fraud sitting in a wheelchair. I also feel like I am a failure, like I have given in, like I should be able to control my body and tell it what I expect it to do. I find it so hard to accept that in reality I appear to have no input where my physical problems are concerned. I always feel a nuisance and in the way in a wheelchair, and hate the idea of looking ‘disabled’, even if, I suppose, I often am! In preparation for our mini-break the wheelchair came out of the garage and the cobwebs and dust were flicked away. Simon re-inflated the tyres, we bought a comfy seat cushion and a very clever back cushion that doubled as a picnic pack slung over the back. The weather had been atrocious and we expected rain so I ordered a very cool purple poncho specially designed for wheelchair users. Instead of sitting in a puddle of water (NO, not that I have accidents! We are talking heavy rain here!) this poncho had cleverly designed ‘flaps’ that go over the back and sides of the wheelchair – also keeping the picnic pack dry at the same time. We were set. We arranged to go by train and using my disabled rail card meant that the cost wasn’t prohibitive. Simon’s sister Wendy agreed to take us to the train station. Everything was organised. The sparkly clean wheelchair sat in the dining room but every time I walked past it I felt a massive heaviness. The thought of being in it for three days just filled me with dread. The day arrived and instead of the rain we were in the midst of a mini heat wave. My purple poncho was not required ! I hadn’t travelled up to London on a train for a long time and was really surprised how wonderfully clean the train was, how smooth it was too, no jigging and swaying, it was as if it was gliding along. There was an allocated space for the wheelchair so it wasn’t in anyones way, nicely tucked in a specially designed rack. It was a truly lovely journey. Comfortable seats, light and airy, just sitting chatting and enjoying the beautiful scenery of Hampshire and Surrey. Everyone at the railway station had been so helpful and nothing was too much trouble. When we arrived at Waterloo we made our way out to the taxi rank and I was pleasantly surprised at how everyone happily moved out of the way, smiling at me whilst they apologised for being where they had every right to be. The taxi driver too was a happy soul, cheerily chatting to us as he drove us to our destination. The wheelchair folded down and was no problem in the back of the cab. We were expecting a very small apartment, basically a bed-sit, but at least somewhere with a separate sitting area and a kitchenette. I couldn’t believe it when we were shown to a very stylish split-level loft-style apartment with far more space that we had ever imagined. We had huge windows with views over beautiful gardens and every modern gadget you could possibly require and very importantly, being in the middle of a heat wave, it had air conditioning too. It was totally fabulous. In the evening we decided to go for a stroll and find somewhere to eat. It had been such a hot day it was great to be out and about, albeit that I was being pushed along in my wheelchair. I had lived in South Kensington with my twin sister when we were 18 years old and hadn’t been back to that area for many many years. Amazingly I still knew my way around and before we knew it we were right outside the garden flat (a posh way of saying basement flat) that Tina and I had shared all those years ago. The whole area still looked exactly as it had done in the mid 70’s and I could direct Simon to some great places to eat. We found an Italian restaurant in Gloucester Road and sat outside in the warmth of the evening enjoying a wonderful supper. I couldn’t believe so many people where out and about, it was almost a party atmosphere. I felt 18 all over again!! Yet again, everyone offered us assistance and gladly moved out of the way as I was wheeled along. The next day we were up at the crack of dawn to go to Chelsea! We arrived super early and for the first couple of hours we could easily navigate around the various exhibits but as the time went on it became increasingly busy until there was not even a foot in front of me. Simon had to be so patient waiting for people to move before he could gently weave the wheelchair through the crowds without clipping people’s ankles. Yet again, people were so kind, some even calling out ‘wheelchair coming through’ and everyone, without exception, would happily move out of the way. Looking at the show gardens was just brilliant. There were crowds, several people deep, all vying to take a look at the gardens, and yet when they saw me in my wheelchair people would move away from the barriers and let me through …. right to the front! Not only did I have the best view in the house (so to speak) but on a couple of occasions, the actual designers came over and chatted with me. They would explain the reason for the design, why they chose certain architectural structures and how they had decided which plants to use. I felt like a V.I.P.!! I saw that the queues for the ladies loos were a mile long and thought that I’d just have to sit and wait it out with everyone else, at least I was sitting down and on my new cushion I couldn’t have been more comfortable. We only waited a couple of moments and I couldn’t believe it when an official lady very kindly asked me to take a totally different route and I was shown into a palatial loo, complete with its own basin and top of the range toiletries. We had the most fantastic day, and, thanks to my wheelchair, we saw everything we could have ever wanted to with the very best possible views. It was everything I had ever hoped Chelsea would be. It was only when we were leaving the apartment that we found they had upgraded our room, totally free of charge, no wonder it was so spacious and well equipped! That type of thing always seems to happen to other people but it happened to us! Again, the train journey back was just great. Everyone, from the moment we left the apartment, until we arrived home, was so helpful and friendly. I can honestly say I felt I had been blessed the whole weekend. I was humbled by the incredible kindness of every single person we met. Not one person complained that I was in the way, or that they had to move for me. Everywhere we went people asked if we needed help, if there was anything they could do for us. It was incredible. When you think of all the people we had come into contact with over that weekend, and it seriously must have been in the hundreds, it was amazing how every one of them showed such consideration. We are all open to the news, whether it’s through newspapers (which I actually don’t read) or through the tv or radio, and the reports always seem to show that the world is full of rude and uncaring people, that we live in a world of selfishness. I can’t believe that we were just lucky with who we happened to meet in London, it proved to me that virtually everyone is actually basically good. Isn’t it a great pity that our news doesn’t reflect the reality of the society we live in? Wouldn’t it be wonderful if our news corporations gave us a more even view of our world, rather than focussing, as they do, on acts of violence and betrayal? So, after all my despondency, seriously considering cancelling the whole weekend and concerns about using my wheelchair, I loved our break in London. I have some wonderful memories of our time at Chelsea, but I know what will stay with me forever were the overwhelming gifts of kindness and thoughtfulness that we experienced from perfect strangers. The world is a far better place than most of us realise. It really was one of the most inspirational experiences. Glad you were able to enjoy the Chelsea Flower Show and that you had a very nice place to stay in London. I often had to push Len around in a wheel chair but I wanted him to enjoy getting out of the house and seeing something different and sharing the experience together. Thank you Auntie Joan! I know I just have to get over the problem – in my head – of being in a wheelchair. It was the most wonderful experience. I am sure that Uncle Len appreciated you pushing him around, just as I appreciate Simon 🙂 and like you say, it is lovely to still be able to do things together too. A heart warming story, especially being part of the disabled population, It raises one’s spirits! Well written too. Thanks Kay ….. I wish every disabled person could enjoy the same experience … it was wonderful! My husband and I have found the same kindness everywhere we went. We spent two weeks in England a few years ago and we couldn’t have been met with nicer people. A simple smile goes a long way. I think the world is full of great people — the news just doesn’t like to focus on them. Glad you met so many on your trip. Sounds lovely. Isn’t it such a shame that it doesn’t! I’m sure the ‘feel good factor’ of everyone could be massively enhanced if only they knew what a great society we actually live in – there is far too much negativity in the press. What a lovely, inspirational experience. Thanks so much for posting about it. It’s a very important reminder to us all, and I loved going along for the trip! Wow!! Just shows what people are capable of, such consideration and, yes respect, seeing you were in a wheelchair. Yes, without exception everyone was so kind!